These sessions don't even include the "fireside chat" with the Core Technical Team that we have planned. We're working on still more sessions too; keep an ear to the ground on this blog and the Google I/O site for the latest info. I'm pretty excited about how the Android sessions for Google I/O are coming together. I think it's going to be a great event, and I hope to meet many of you there. The other topic I want to mention is that our partners at HTC have uploaded a new system image for Android Dev Phone 1 owners. This new image is mostly the same as the one we mentioned earlier this month, but adds voice dialing. Note that not all features will work correctly in all countries, such as voice dialing and Google Voice Search which currently only work well for US English. Additionally, there are some features that we aren't able to make available at all in some countries. For instance, this build can't currently include Google Latitude due to privacy standards in some regions. We'll always keep the ADP1 builds as full-featured as we can, but it's important to remember that these devices are primarily intended for development, and won't necessarily have all the features included on mainstream builds. I hope this news is useful to you. As always, happy coding! For no particular reason other than to celebrate this particular Monday, I wanted to update developers on two Android-related news items. tag, sometimes even too easy and you might end up with user interfaces that contain a large number of views, some of which are rarely used. Thankfully, Android offers a very special widget called ViewStub, which brings you all the benefits of the <include /> without polluting your user interface with rarely used views. A ViewStub is a dumb and lightweight view. It has no dimension, it does not draw anything and does not participate in the layout in any way. 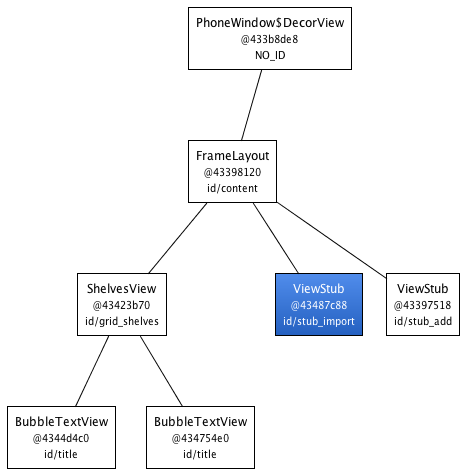 This means a ViewStub is very cheap to inflate and very cheap to keep in a view hierarchy. A ViewStub can be best described as a lazy include. The layout referenced by a ViewStub is inflated and added to the user interface only when you decide so. It is very important to remember that after the stub is inflated, the stub is removed from the view hierarchy. As such, it is unnecessary to keep a long-lived reference, for instance in an class instance field, to a ViewStub. A ViewStub is a great compromise between ease of programming and efficiency. 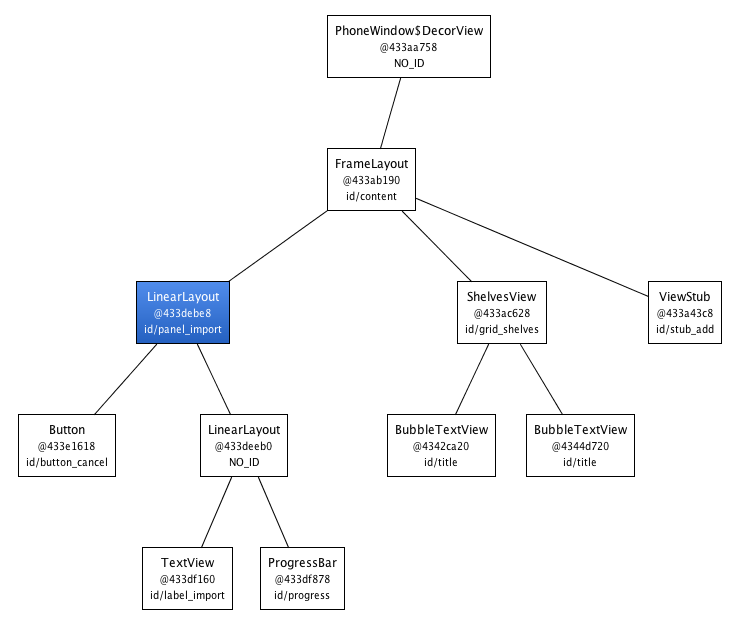 Instead of inflating views manually and adding them at runtime to your view hierarchy, simply use a ViewStub. It's cheap and easy. The only drawback of ViewStub is that it currently does not support the <merge /> tag. Sharing and reusing layouts is very easy with Android thanks to the <include /> tag, sometimes even too easy and you might end up with user interfaces that contain a large number of views, some of which are rarely used. Thankfully, Android offers a very special widget called ViewStub, which brings you all the benefits of the <include /> without polluting your user interface with rarely used views. , the Android Dev Phone 1 (ADP1) went on sale, giving developers access to unlocked hardware for their work. A few weeks ago, consumers with retail devices received an over the air update with the 1.1 release of Android. I know that many developers will be pleased to hear that today, our colleagues at HTC have released a 1.1 version of Android for the Android Dev Phone which you can install on your device. If you have questions about the process of updating your device, you can ask the mailing list we've set up for such questions. This new system image is fully compatible with Android 1.1. To see a list of everything that's new, you can review the notes from the 1.1_r1 SDK. 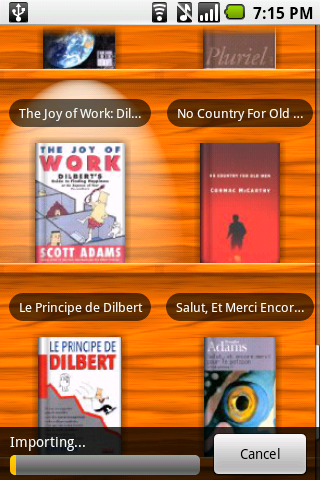 This update also includes support for searching by voice, and priced apps in the Android Market. Some developers have asked about the support for copy-protected apps on developer devices, and indeed there is a limitation you should be aware of. Many developers are concerned about the unauthorized redistribution of their applications, so they make use of the copy-protection feature (known as "forward locking") which prevents applications from being copied off devices. However, developer phones like the ADP1 allow for unrestricted access to the device's contents, making it impossible to enforce copy protection. As a result, the Market application on such devices is not able to access copy protected apps, whether they are free or paid. If you choose to add copy protection when you upload your application to the Android Market, then you won't be able to test it on the ADP1's Android Market client. Your application will always be accessible to users who have standard configurations though, and if your application (whether it is free or paid) is not copy-protected it will appear on all devices, including developer configurations. If you own an Android Developer Phone, I definitely suggest you take advantage of this update. There's lots of good stuff in there, and the new software is backward compatible with Android 1.0, too. The original 1.0 system image is also now available, you need to downgrade for any reason. Happy coding! Back in December, the Android Dev Phone 1 (ADP1) went on sale, giving developers access to unlocked hardware for their work. A few weeks ago, consumers with retail devices received an over the air update with the 1.1 release of Android. I know that many developers will be pleased to hear that today, our colleagues at HTC have released a 1.1 version of Android for the Android Dev Phone which you can install on your device. If you have questions about the process of updating your device, you can ask the mailing list we've set up for such questions. startup time of your activities. Both these techniques rely on a single feature, the window's background drawable. The DecorView is the view that actually holds the window's background drawable. Calling getWindow().setBackgroundDrawable() from your Activity changes the background of the window by changing the DecorView's background drawable. As mentioned before, this setup is very specific to the current implementation of Android and can change in a future version or even on another device. In this new version of the application, the drawing speed went up to 51 frames per second, or 19 milliseconds per frame. The difference of 3 milliseconds per is easily explained by the speed of the memory bus on the T-Mobile G1: it is exactly the time it takes to move the equivalent of a screenful of pixels on the bus. The difference could be even greater if the default background was using a more expensive drawable. You then need to apply the theme to your activity by adding the attribute android:theme="@style/Theme.NoBackground" to your <activity /> or <application /> tag. This trick comes in very handy for any app that uses a MapView, a WebView or any other full screen opaque view. Opaque views and Android: this optimization is currently necessary because the Android UI toolkit is not smart enough to prevent the drawing of views hidden by opaque children. The main reason why this optimization was not implemented is simply because there are usually very few opaque views in Android applications. This is however something that I definitely plan on implementing as soon as possible and I can only apologize for not having been able to do this earlier. The same exact trick is used in the Google Maps application that ships with the T-Mobile G1. When the application is launched, the user immediately sees the loading tiles of MapView. This is only a trick, the theme is simply using a tiled background that looks exactly like the loading tiles of MapView. Sometimes the best tricks are also the simplest so the next time you create an activity with an opaque UI or a custom background, remember to change the window's background. Download the source code of the first example. 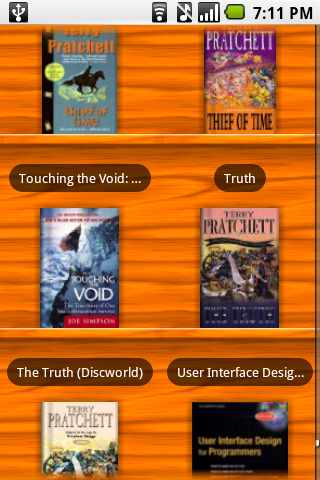 Download the source code of Shelves. Some Android applications require to squeeze every bit of performance out of the UI toolkit and there are many ways to do so. In this article, you will discover how to speed up the drawing and the perceived startup time of your activities. Both these techniques rely on a single feature, the window's background drawable.